The newly formed Justice League members Superman, Batman and Wonder Woman discover another super hero on the planet. Aquaman and the group must band together to prevent a war between the inhabitants of land and sea. Featurettes, sneak peaks and bonus cartoons add to the non-stop action. Depicts the first time that Superman; his alter ego, Clark Kent; award-winning journalist Lois Lane; and Perry White, Editor-in-Chief of the Metropolis newspaper The Daily Planet, had been seen in animated form since they were immortalized in the iconic Superman short films of the 1940s. In addition, this series marked the animation debut of photo journalist Jimmy Olsen, as well as classic Superman villains such as archenemies Lex Luthor and Brainiac. The all-new original movie is a thrilling film for the whole family and features some of the Justice League's most notable members. Fans won't want to miss this action-packed hit! After crafting a monumentally over-the-top plan to take over the world by expanding the polar ice caps, mastermind Lex Luthor is missing and widely presumed dead. One thousand years later, Luthor is discovered and memorialized in the Legion of Superheroes' museum, where the teenage superhero, Karate Kid, accidentally releases him. Among the 42 cartoons showcased are three are Academy Award winners (Best Short Subject: Cartoons). They include The Little Orphan, in which Jerry takes care of Nibbles, a hungry little mouse who causes chaos at the Thanksgiving table; The Two Mousketeers, which features Jerry and Nibbles as two mousketeers who try to help themselves to a banquet that Tom is guarding; and lastly, Johann Mouse, which stars Jerry as a music-loving, little mouse who lives with composer, Johann Strauss in Vienna. The Man of Steel is aptly handling day-to-day crime while helping acclimate Supergirl to Earth's customs and managing Lois Lane's expectations for their relationship. Personal issues take a back seat, however, when the horrific force responsible for the destruction of Krypton - Brainiac - begins his descent upon Earth. Brainiac has crossed the universe, collecting cities from interesting planets - including Supergirl's home city of Kandor - and now the all-knowing, ever-improving android has his sights fixed on Metropolis. A must-own collection featuring five of the author's most beloved animated classics, which are available together on Blu-ray(TM) and DVD in deluxe editions for the first time. Set for release on February 19, 2013, this compilation will include such all-time-favorite TV specials as The Lorax, Green Eggs and Ham and Other Stories, How the Grinch Stole Christmas!, The Cat in the Hat and Horton Hears a Who! along with loads of original enhanced content. Frank Miller's landmark graphic novel about fear, hope and redemption is celebrated with proper measures of haunting visuals and intense action in the next entry in the popular, ongoing series of DC Universe Animated Original Movies. Peter Weller leads a stellar voice cast as Bruce Wayne/Batman. Joining Weller behind the microphone is David Selby as Commissioner Gordon, Ariel Winter as Carrie/Robin, three-time DCU veteran Wade Williams as Harvey Dent/Two-Face, and Michael McKean as Dr. Bartholomew Wolper. Facing the downside of middle age, a restless Bruce Wayne pacifies his frustration with racecars and liquor - but the Bat still beckons as he watches his city fall prey to gangs of barbaric criminals known as The Mutants. The return of Harvey Dent as Two-Face finally prompts Wayne to once again don the Dark Knight's cowl, and his dramatic capture of the villain returns him to crime-fighting - simultaneously making him the target of law enforcement and the new hope for a desolate Gotham City. Follows Hal Jordan and the Green Lantern Corps on a treacherous journey through deep space. As Earth's Green Lantern, Hal must face down an invasion from the villainous Red Lantern Corps, who will stop at nothing to destroy and silence the Green Lantern Corps forever. Joined by his former drill sergeant Kilowog, and several all-new heroes, Hal brings the cosmic battle against the forces of evil to the far reaches of the galaxy. 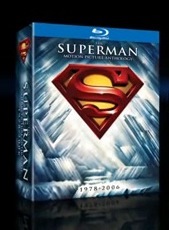 This ultimate collector's set for the ultimate fan features over 192 hours of content - including all 218 episodes, over five hours of newly added special features such as an unaired, never-before-seen Superboy pilot from 1961, a retrospective look at the series with over 100 minutes of season featurettes, a decade of Comic-Con featurette and more! In a universe as vast as it is mysterious, an elite, powerful force has existed for centuries. Protectors of peace and justice, they are called the Green Lantern Corps. Warriors sworn to keep intergalactic order, each Green Lantern wears a ring that grants him the ability to create anything his mind can imagine. But when a new enemy called Parallax threatens to destroy the balance of power in the Universe, their fate and the fate of Earth lie in the hands of their newest recruit, the first human ever selected: Hal Jordan. Available now in superb hi-def, with new digital/hi-def film masters, the must-own comprehensive Blu-ray release includes all six versions of the films in the original Superman theatrical franchise -- Superman: The Movie – Original Theatrical, Superman: The Movie – Expanded Edition, Superman II – Original Theatrical, Superman II – The Richard Donner Cut, Superman III – Original Theatrical, Superman IV – Original Theatrical, plus Superman Returns. The Collection also boasts 20 hours of bonus features including the never-before-seen original opening to Superman Returns. Smallville. Season eight. Yeah, I'm as shocked as you are. More so that the show seems to have improved somewhat despite the departure of about half the original cast.